Vandalia, Ohio Feeding ban revised to include TNR language. Debra Smith, co-founder of CALICO TNR, holds one of the stray cats Friday that the shelter is neutering to cut down on the overpopulation of feral cats. One pair of cats and their subsequent litters can produce as many as 420,000 cats in the span of just seven years, according to some studies. So Tanya Jordan figures if she can stop just 50 cats from breeding, she’ll make quite a dent in the overpopulation of feral cats on the streets of Clark County. His Hands Extended Sanctuary, a St. Paris-based non-profit where Jordan is executive director, along with CALICO TNR teamed up Friday to humanely trap cats in Springfield parks and neighborhoods as part of their spay/neuter and release program. Volunteers set up traps stocked with foods in areas known to have strays. Then the animals were loaded into carriers and brought to the sanctuary, where staff veterinarians spayed and neutered them. A small clip is also put on their ears, known as “ear-tipping,” to indicate that the cats have been sterilized. About 22 cats went through the program Friday, with additional cats coming in next week. Assistance from the sanctuary and its Facebook followers helped make it happen, Jordan said. After a few days of medical care, the cats will be released where they were found. Jordan said it’s heart-breaking she can’t find homes for all of them. Additional donations will allow CALICO to trap more cats this summer to be spayed and neutered. For more information on the programs, visit hishands-extendedsanctuary.com or calico-tnr.org. Every cat that goes through the program reduces the overpopulation problem, said CALICO co-founder Debra Smith. “There’s things you can do. One person can make a difference. One cat can make a difference,” Smith said. ST. PARIS – As partners in the fight against animal overpopulation, His Hands Extended Sanctuary and trap-neuter-release group Cat Alliance Located In Central Ohio (CALICO) on Friday had a joint spay and neuter program. CALICO has been gathering feral and loosely-owned cats, those in someone’s keeping for a while before being turned away, from mostly Clark County and took them to His Hands Extended for the procedures. His Hands had pledged to cover the spaying and neutering cost for 25 such felines and the organization challenged its Facebook friends to raise funds for an additional 25. Executive Director for His Hands Extended Tanya Jordan said the organization took in 22 cats for Friday procedures. She said additional money was raised within four days. “They responded so graciously,” Jordan said. “We’re so grateful.” The page has 1,337 likes, and Jordan said there is a dedicated core of page followers who give when a request is posted. She and CALICO representative Debra Smith are passionate about reducing feline suffering through spaying and neutering. Jordan said cats in one litter result in 420,000 kittens over seven years. “It’s going to make a big difference,” Jordan said of Friday’s procedures. CALICO is not a rescue group, but focuses on catching, altering and returning stray cats to their environs. This service dovetails nicely with His Hands’ non-profit sanctuary status and its operating facilities. His Hands works with two veterinarians, Dr. Amanda Wolf and Dr. Monica Monto, and two veterinary technicians, Natalie Davis and Kristina Studebaker, to run its low-cost alteration program, which is at the heart of the sanctuary’s purpose. “She has no borders and we have no borders,” Smith said. 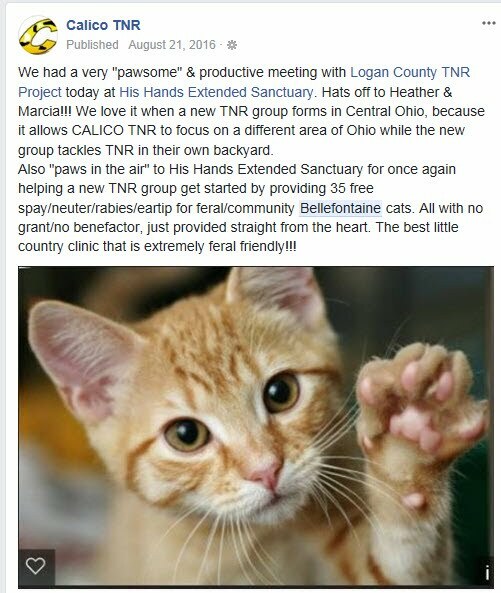 CALICO’s labors have resulted in the spaying and neutering of 168 cats since the group was founded in September 2011. His Hands has worked with humane societies in Auglaize, Shelby, Hancock and Miami counties as well as with the Black and Orange Foundation, Silver Linings, Beagle Rescue, and the Greater Dayton Humane Society. Jordan reported that His Hands Extended spayed and neutered 2,250 animals in 2012 and has altered 739 animals this year. The sanctuary was recognized as a 501(c)3 charity in October 2009. The sanctuary’s website is www.hishands-extendedsanctuary.com.